Et tu, Sci-Fi? Est tu? As with my first and second posts, I developed a few tools in order to scrape self-publishing data from the sites of Amazon and Barnes & Noble; the data focused on new titles released within the past few months. This time, I focused on the self-published titles which are part of a series. The patterns are starting to emerge…and once again, you wound me, sci-fi authors. But who knew that photo essays had series? Do They Combine Masturbation and Writing, in order to Save Time and Meet Deadlines? As with my previous post, I developed a few tools in order to scrape self-publishing data from the sites of Amazon and Barnes & Noble; the data focused on new titles released within the past few months. Unlike last time, though, I focused on the authors instead of the titles, looking for genres with the most prolific authors. Least surprising: the authors who put their characters in fundies and write about purple-headed warriors with love pudding. 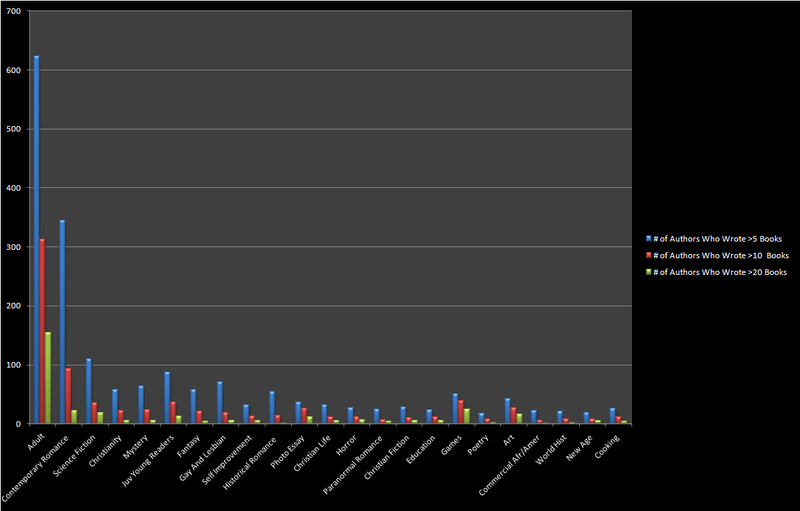 Most surprising: sci-fi authors. (I won’t name the authors who obviously pump out drivel, but as a fan of classic science fiction, I hope that a sandworm consumes all of them.) Most sad: cooking authors…because nobody has yet told them about the Internet. 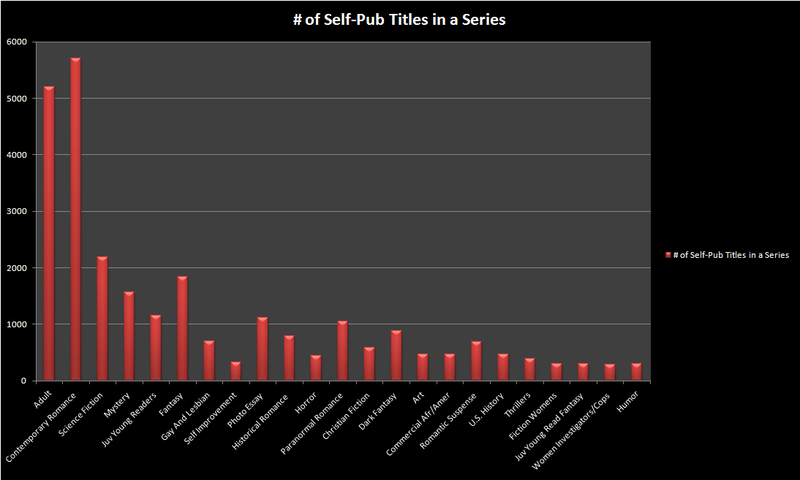 As an author , I was curious about the exact numbers of independent titles in certain genres. 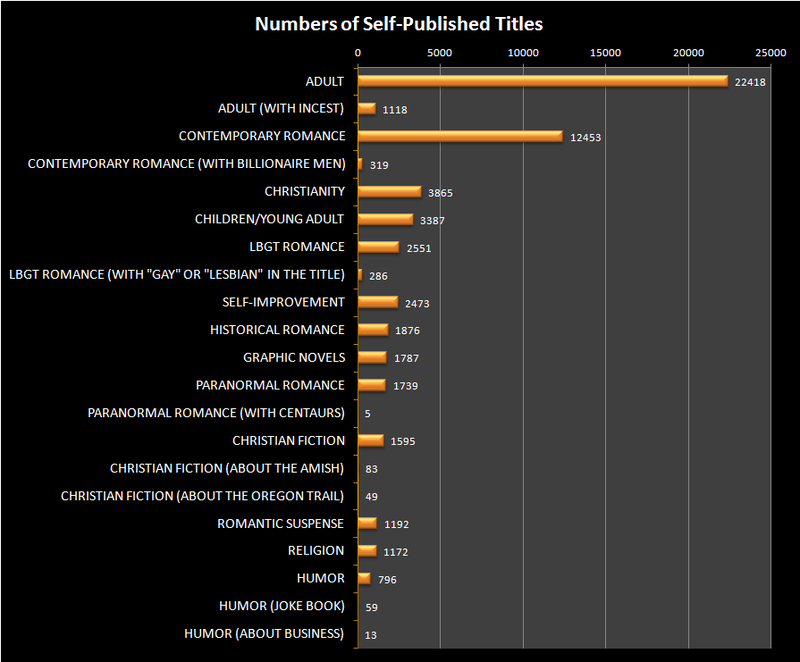 So, after scraping some eBook metadata from Amazon and Barnes & Noble, I compiled some interesting figures which reflect the trends of self-publishing over the last few months. Needless to say, I’m not exactly hopeful for my career as a professional raconteur. If there’s any correlation between the number of titles and general public interest, I think that my literary future might be in trouble if my subsequent title doesn’t mention blowing something other than a bridge. Consequently, my next book will be about incestual Amish centaurs who are lusty billionaires.